It has been years since I preached through the book of Colossians and therefore years since I read through Robertson’s great commentary on that book. In preaching though Colossians this summer, I have reread this book with great appreciation. These individual commentaries are much more satisfying than his Word Pictures (which can be very helpful if he happens to define the word you’re looking for) and bring a mix of one of the greatest Greek minds of the day with surprising practical application. 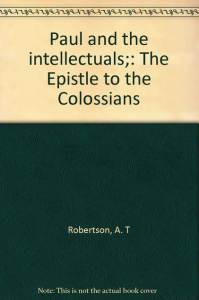 Robertson had a firm conviction that Paul was combating Gnosticism (hence the title “Intellectuals”) which many scholars today think has been proven premature. Nevertheless the world has never been without the cultic denial of the person of Christ, and Robertson was more than capable of applying the biblical text.